I wanted to write a second post on the final project I did for the Data Science course I took at General Assembly. I made a short presentation you can see here. And you can see all the code here. And lastly, you can see one cluster in a more interactive way here. So the basic idea was to compare how clustering algorithms can compare to probabalistic topic models, in this case, LDA. The problem in a more general sense can be thought of as so: there exists some collection of textual data, more than one person can categorize. How do you extract topics and sort or categorize the documents automatically in a repeatable, reliable way? For my data, I used the TED Talks from 2013 already labeled with topics, but rather than treat them as categories for a supervised classification task, I'm using them to double check my own results and approaching the problem with unsupervised clustering algorithms to see how it compares to Latent Dirichlet Allocation. For the scrubbing, I found out that TONS of words were combined (somehow missing a space). Also, I wanted to get rid of stopwords. 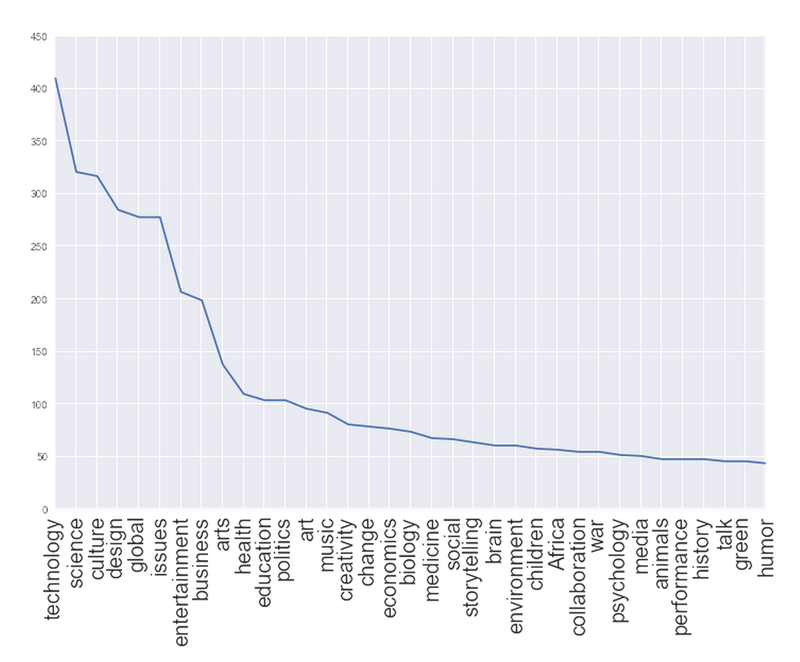 And I used a bunch of stopword lists from ranks.nl as well as all the stopwords in NLTK for English. The sklearn tfidf vectorizer made that ridiculously easy. I truncated the terms to just include the top 10,000 most important words (by tfidf values) - however I'm not sure if thats reflected in the notebook (I had a bunch of verisons and just put one that gave the general idea up there). Note: from clustering to dimensionality reduction to visualization, I compared hierarchical agglomerative clustering and kmeans clustering. I ended up pretty much sticking with kmeans for the final versions of everything because it performed better (although they were relatively close). Now this is some sort of gold standard; the talks are already labeled. The only part where I actually used this data was when I guessed what k was - In the previous image you can see that after the topic health, there is a pretty similar usage of topics and its in slow, steady decline. The main topics are obviously the first ~10 or so. but how'd u kno k=10 dawg? I did try to pretend that I didn't know how many topics there were but in the end you're going to make a decision somehow. The between sum of squares (sum of squared distances from each point to the cluster sample mean) divided by the total sum of squares (sum of squared distances from each point to the global sample mean) is one way of measuring goodness of fit for clustering. That metric gives us just about .75 when k=10, meaning basically that 75% of variance is explained by these clusters. When k=20, we get .78, and when k=40, we get .81. So if quadrupling the number of clusters only gives us 6% more variance explained, I figured that even if I hadn't had the topics from the actual data, I probably would've picked a relatively similar k anyways since I ideally I want a small number of clusters that represent distinct topic groupings. So if we look at the topics as they're assigned (to see if our clusters are representing any legitimate groupings in relation to the already-assigned topic labels), we see a few clusters that represent distinct themes. We'll that seems pretty general. Can't take too much from that - except that it talks alot about technology and design and culture... This is the most general category; it covers the T. E. and D. of TED. Since we can see that technology is number one, with a close second of design, then we move to seeing some of our other topics show up. Much more focused here on culture, entertainment, and global issues. Hmm, once again, technology, design, business, but focusing more towards green energy at the end there. Here we actually see a departure from the earlier topics; were talking more about global issues, business, war, politics. This is obviously more about art ! Music, performance, live performances. So in 10 topics we see a few different distinct topics. Now what if we just counted the top words in each clusters? Topic 1: Super general ! Unhelpful ! So even just counting the top occuring words do help us learn a little bit more about certain clusters, but for the most part, very general words like "thing" and "time" sort of obfuscate what we are really trying to get at. In machine learning and statistics, dimensionality reduction or dimension reduction is the process of reducing the number of random variables under consideration, and can be divided into feature selection and feature extraction. However, it's quite hard to visualize 1000's of dimensions. So below, I go about plotting our clusters in 3 dimensions; yes - we are losing tons of data ! But, this reduction allows us to actually see the data. In order to do these reductions, I compare the following dimensionality reduction algorithms. Simply put, PCA is a way of finding the most important parts some data set. More exactly, it's an orthogonal transformation of observations into some number of linearally uncorrelated variables, in this case, trying to summarize 1000's of dimensions into three. Basically, the first principle component is the component which accounts for this highest variance of the data (it explains the most), and the subsequent component(s) is the next in terms of variance explanation and also orthogonal (i.e. uncorrelated) with the previous component(s). Very similar to PCA. A gross simplification; SVD is a way of factorizing a large matrix into 3 sub parts. These 3 parts can re-create the matrix, so we take some of one of the components to make a smaller, approximated copy of the original. This is a fascinating algorithm. It has a few main parts. Firstly, it creates a probability distribution that represents similarity between points (in the high dimensional space). Then, it creates a similar probability distribution over the low dimensional space and then minimizes the distance between the two (Kullback-Leibler divergence). ICA finds the independent components (also called factors, latent variables or sources) by maximizing the statistical independence of the estimated components. Typical algorithms for ICA use centering (subtract the mean to create a zero mean signal), whitening (usually with the eigenvalue decomposition), and dimensionality reduction as preprocessing steps in order to simplify and reduce the complexity of the problem for the actual iterative algorithm. Whitening and dimension reduction can be achieved with principal component analysis or singular value decomposition. I compared a quite a few different combinations. A large assumption that I was making (or exploring) was that using more than one type of dimensionality reduction would be best. So each time, I compared two types. I did test only using one and ended up liking the double reduction better. Note the second number always needs to be 3 since we're trying to create visualizations for humans. I tried varying the first number too, but there are an infinite number of variations of course so I ended up just picking a few. Where each cid = clusterid. After translating my data into that format, I forked the repo, put my data in, and put it here.